Miflex hoses feature a patent pending double nylon safety braiding designed to outperform and oulive traditional rubber hoses. Miflex hoses are 30% lighter than an equivalent length rubber hose and have unmatched flexibility. 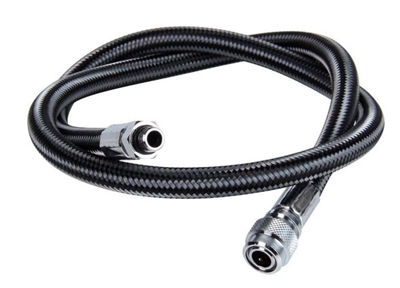 You can tie a Miflex hose in a knot and be assured of continuous, uninterrupted airflow. Miflex Hoses have a minimum burst pressure of 3600 psi (250 bar), more than twice rubber hoses. Use these hoses for BC or Dry Suit inflation.